Socialism is a system in which every person in the community has an equal share of the various elements of production. Such a form of ownership is granted through a democratic system of governance. Socialism has also been demonstrated through a cooperative system in which each member of the society owns a share of communal resources. The rule of engagement in a socialistic system is that each person receives and contributes according to his ability. For this reason, individuals in a socialistic society tend to work very hard. Members of the community receive a share of the national pie once a percentage is taken off for the purpose of communal development. The areas into which resources are channeled include defense, education, and transportation. Communal good can also be interpreted to mean taking care of people who can’t contribute to social developmentSocial SecuritySocial Security is a US federal government program that provides social insurance and benefits to people with inadequate or no income. The first Social Security Act was signed into law in 1935 by President Franklin D. Roosevelt. The law underwent several modifications over the years to include several social welfare such as children, caretakers, and the elderly. In democratic socialism, factors of production are under the management of an elected administration. Vital goods and services such as energy, housing, and transit are distributed through centralized planning while a free market systemFree MarketA free market is a type of economic system that is controlled by the market forces of supply and demand as opposed to government controls that involve price is used to distribute consumer products. The running philosophy of revolutionary socialism is that a socialistic system can’t emerge while capitalism is still in play. Revolutionaries believe that the road to a purely socialistic system requires a lot of struggle. In such a system, the factors of production are owned and run by workers through a well-developed and centralized structure. Libertarian socialism works on the assumption that people are always rational, self-determining, and autonomous. If capitalism is taken away, people naturally turn to a socialistic system because it is able to meet their needs. Under market socialism, the production process is under the control of ordinary workers. The workers decide how resources should be distributed. The workers sell off what is in excess or give it out to members of the society, who then distribute resources based on a free market system. Green socialism is protective of natural resources. Large corporations in a green socialistic society are owned and run by the public. In addition, green socialism promotes the development and use of public transit, as well as the processing and sale of locally grown food. The production process is focused on ensuring that every member of the community has enough access to basic goods. Moreover, the public is guaranteed a sustainable wageRemunerationRemuneration is any type of compensation or payment that an individual or employee receives as payment for their services or the work that they do for an organization or company. It includes whatever base salary an employee receives, along with other types of payment that accrue during the course of their work, which. A socialistic system ensures that no worker is exploited. How? Well, each of the workers in the community has a say on how the resources are managed, and each person receives and contributes based on an individual’s potential. According to the socialistic system, each person is guaranteed access to basic goods, even those who are not able to contribute. As a result, the system helps to minimize poverty levels in the society. In addition, each person has the same right to access health care and other important social aspects like education. The system disapproves discrimination, and each person does what he is good at or what he enjoys best. If there are jobs that should be done and there is no one to perform them, a higher remuneration is provided. Natural resources are protected for posterity. Perhaps the greatest disadvantage of a socialistic system is its reliance on cooperative pooling to get things done. In addition, people who are competitive in the community are viewed in a negative light. The society expects cooperation and not competitiveness. According to socialism, competitive individuals tend to find ways to cause social unrest for personal gain. Socialism does not reward entrepreneurial ventures or competitiveness. Consequently, a socialistic system does not encourage innovation as much as capitalism. CapitalismCapitalismCapitalism is an economic system that allows for and encourages the private ownership of businesses that operate to generate profit. Also known as the market system, capitalism is characterized by private land ownership rights, competitive markets, the stable rule of law, freely operating capital markets, low, also known as a free market system, and socialism differ based on their rational underpinning. In addition, they also differ based on implied or stated goals, as well as the framework of ownership, and the production process. Structurally, a free market system and socialism can be distinguished based on rights to property, as well as control of the production process. Under a capitalistic economy, enterprises and private individuals control the means of production together with all the profits. Under a socialistic structure, a central authority controls the resources used in the production process. Private property is unheard of, but where it exists, it is in the form of consumer products. While a capitalistic system is dependent on the decisions of independent persons, which influence the production process, a socialistic structure controls the production process by regulating the market system. 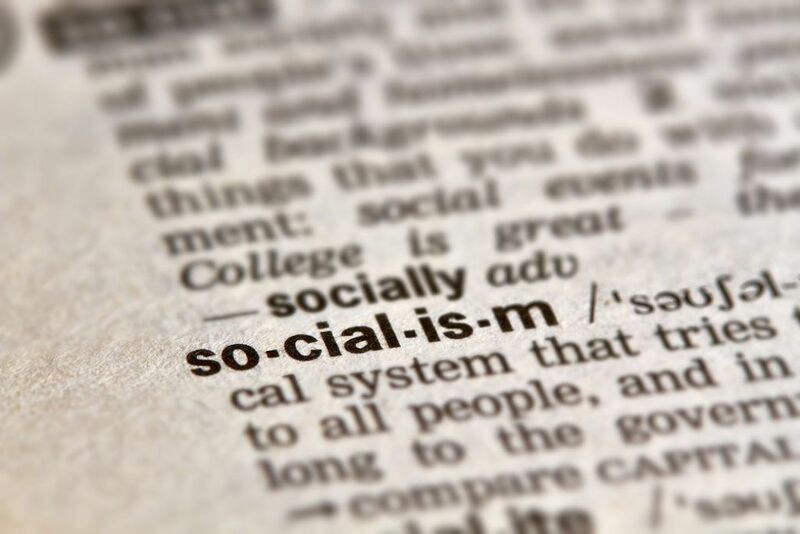 Unlike capitalism, socialism is dependent on the efforts of each member of the community. Members of the community pool together to manipulate factors of production, and the proceeds are shared equally by all. Its key advantage is that no single member works more than the rest, and individuals who can’t participate are provided for as well. However, since the government controls everything, it is possible for it to abuse its authority.